Because of the risks involved, both the American Academy of Pediatrics (AAP) and the U.S. Consumer Product Safety Commission (CPSC) advise against bed-sharing. The AAP does recommend the practice of room-sharing without bed-sharing. 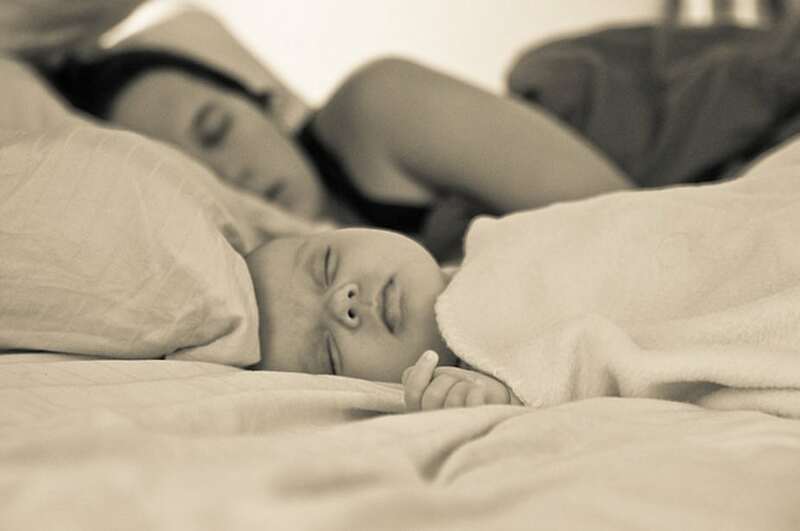 Sleeping in the parents’ room but on a separate surface lowers a baby’s risk of SIDS. Besides the potential safety risks, sharing a bed with a baby sometimes prevent parents from getting a good night’s sleep. And infants who sleep with their parents learn to associate sleep with being close to a parent in the parent’s bed, which can become a problem at naptime or when the baby needs to go to sleep before the parent is ready. Put a bassinet, play yard, or crib next to your bed. This lets you keep that desired closeness, which can be especially important if you’re breastfeeding. Having an infant sleep in a separate space in the same room as the mother reduces the risk of SIDS. Experts recommend that infants sleep in their parents’ room until their first birthday. If parents prefer to move the baby to another bedroom, it’s best to wait until their child is at least 6 months of age.